New Trillium Outback camper brings the glorious past from 70’s in same package (molded fiberglass egg-shaped shell) but made in modern technology and equipped with modern amenities. It’s not possible to write about new 2017 Outback Trillium trailers without touching the history of its famous predecessor. 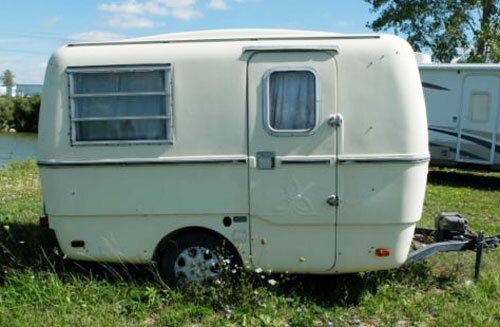 It all goes back to late 60’s when the Canadian Company Boler introduced first molded-fiberglass “egg-shaped” travel trailers. 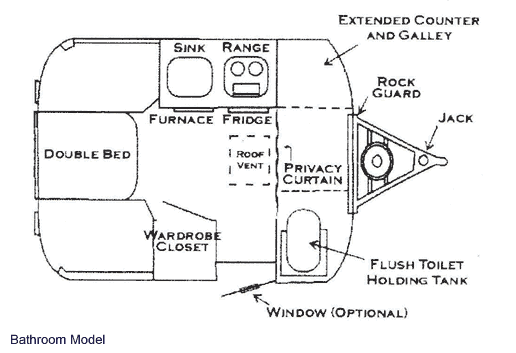 It was a real revolution in the RV industry thanks to first hard-wall, all-fiberglass, water (and time)-proof designs. Trillium all-fiberglass travel trailers were introduced shortly after Bolers (early 70’s) and were manufactured till 1980 when the company closed the doors. Obviously, the time was still not ripe for Lite, Fuel-efficient, Green technologies. Fortunately, some ten years ago Joe Thoen picked-up what survived from legendary Trillium trailers (name, vintage shape, molded-fiberglass technology and may be the most important – their fame still resonating among RVers). The new company - Team Trillium Trailers Manufacturing Ltd. started operation in Calgary and in 2007 with introduction of a new Trillium camper. 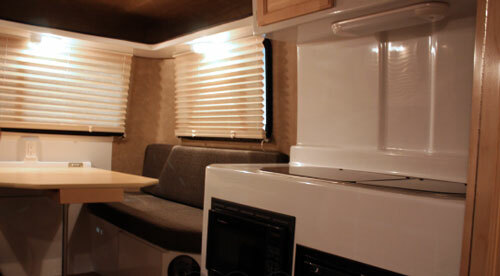 The idea was to keep all for what the old Trillium trailers were appreciated and recognized: compact size, light-weight (easy to tow by typical family cars), , all-fiberglass shell (no rot, no water leaks), durability etc…), while applying modern manufacturing technology, new composite materials and fitting the new camper with present-day features. Bath w/flush toilet and privacy curtain (sleeps 2) plus an extended counter and galley. (Note that there is no shower due to the limited space). Probably roomier wet-bath will be better solution instead of the extended galley and countertop. Trillium models were marketed under the names Trillium 1300 (13’3” long, 2,000 lbs GVWR) and 1500 (15’3” long, 2,200 lbs GVWR), Trillium SideKick and recently Trillium Outback. The cabinets in Trrillium campers are also from molded fiberglass, but they are made separately and then glued to the shell. Competition uses different techniques – majority of them screw cabinets to hooks “fiberglassed” into the shell during shell’s molding process. 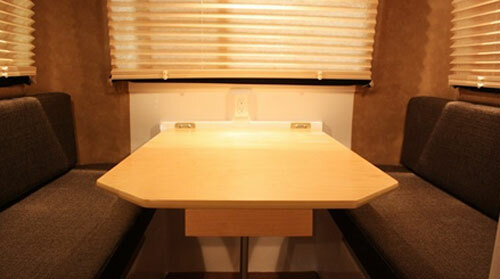 Some (like Oliver Trailers) make all cabinets and interior furniture integral part of the shell. Thanks to the energy sources (LPG, batteries and solar panels), the Trillum Outback has quite good autonomy. This was actually the company’s goal, because small travel trailers are ideal for exploring the nature, for going off-road, out of the beaten tracks where there is no grid! Now time for news - The bad news is that somehow (as it seems) the “old fame” did not catch a new fire. Probably strong competition within all-fiberglass campers RV industry, but I also guess quite poor advertising and campaign (the factory website does not provide even well-defined specifications for the camper) are some (but most likely not the only) problems. It’s sad, because the Trillium campers should be able to hold their well-deserved position as an entry-level camper for with eco-conscious young couples (small is beautiful) or for retired couples enjoying nostalgic feelings from their youth! (indeed, the latter is a largest group of buyers). 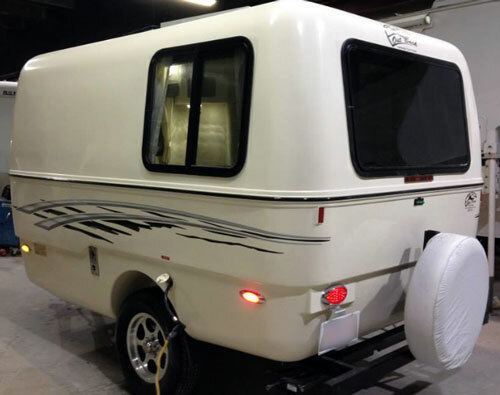 Like most companies manufacturing fiberglass campers, Team Trillium sells their models directly from the factory. This approach is mainly driven by the fact that fiberglass campers are finished with high level of customization, in most cases based on an individual order. Good news (at least for owners of old Trillium campers – the Team Trillium provides most parts to replace the broken ones in old campers from 70’s and 80’s. They also can replace most of the old, broken amenities with new modern ones. Certainly the long list of available options shows, that the Outback trailer can be customized according to owner’s needs and wishes. It’s always a good approach – on one side it cuts down cost allowing customers to give up on “stuff” they do not need, or prefer the DIY approach. But it is also a potential “trap”, because the price of the basic version may be “misleading” as cost quickly grows with each selected option. But obviously you cannot have both….